What Business Tax Costs Can Be Deducted? Payments for Business Taxes: Which are Deductible? Which are Not? All businesses must pay taxes, just as individuals must. The bad news for businesses is that they have more taxes to pay. The good news is that many of these taxes are deductible as business expenses. The following looks at different kinds of taxes that businesses must pay and whether they are deductible or not. You can only deduct a tax in the year in which it was paid. To be deductible as a business expense, the tax payment must be business-related. You can't deduct personal taxes, like taxes on your home or personal property or taxes paid on non-business related activities. 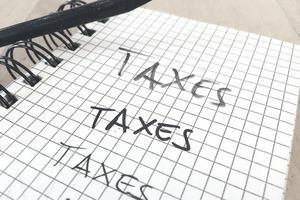 The IRS is very clear on this: You cannot deduct federal income taxes These are the taxes you pay on your business income, and you can't deduct the taxes you paid the IRS. Your state income taxes may be deductible, depending on your business type and your state. Corporations, S corporations, and partnerships deduct state income taxes on the business return. If you are filing a Schedule C for your business, you can't deduct state income taxes on this form, but you can deduct sales taxes on your personal tax return (Schedule A). If your business is a corporation or partnership, you can deduct allowable taxes through your business tax return. If you are a small business or self-employed, and you file your business tax return on Schedule C along with your personal tax return, you can deduct allowable business taxes on Line 23. If you have employees, your business portion of payroll taxes is deductible to you. This does not include amounts withheld from employee pay for federal income taxes or for FICA taxes (Social Security and Medicare tax). For example, if you have a total of $5,000 that you have withheld from employees for FICA tax, you must pay an additional $5,000 as your employer portion. Your employer portion is deductible as a tax. Self-employment taxes are paid by business owners for Social Security/Medicare benefits. The amount is based on the profit of the company, but the business does not pay these taxes; they are paid on the individual's personal tax return. Like FICA taxes paid by employees, self-employment taxes are not deductible. But, as part of the calculation for your self-employment tax, you can deduct half of the amount of the tax as part of the calculation for your personal adjusted gross income. Taxes on business travel expenses, such as hotel taxes, air travel taxes, meal taxes, entertainment, laundry, etc. Miscellaneous taxes on items like membership dues, stamps, safe deposit box rental, and others. Taxes on membership dues are deductible if the dues themselves are deductible. Only dues for business-related organizations are deductible. You may deduct the cost of property taxes if the tax is based on the assessed value of the real estate. You may not deduct property taxes paid for what the IRS calls "local benefits;" that is, for "local benefits and improvements that tend to increase the value of your property," including assessments for streets, sidewalks, water mains, sewer lines, and public parking facilities." Sales taxes you pay for items you purchase for business are deductible if the purchase itself was a deductible business expense. You don't need to be separated out; these taxes are considered as part of the cost of the item. Just include the total amount you paid, including the tax. For a large item purchase, like a car, the sales tax is determined separately; check with your tax professional to see how to handle this. Sales taxes are just one example of state taxes that are deductible. State and local income taxes may be deductible on your personal income tax return (using Schedule A). If your business is a corporation or partnership, the business can deduct state and local taxes as a business expense, as long as they are directly related to the business activity. Disclaimer: This article is for the purpose of providing general information. It is not intended to be tax or legal advice, and is not intended to show all the restrictions and qualifications for deducting these taxes. Before you attempt to deduct any taxes from your business tax return, check with your tax professional. For more information on deductions for business taxes, see IRS Publication 535: Business Expenses.